Benefits to You, Your Pet and the Planet. When you decide to bring a dog into your home, you're not only gaining a pet, but a loyal companion that will soon show you why dogs have long been considered man's best friend. However, the road to unconditional companionship can be bumpy, there's no bones about it. Potty training a new dog can be difficult, creating a feeling of frustration between pet and owner. But now with WizSmart's innovative dog pee pads, you can foster a more successful training experience, leading to a happy dog, and a happy you. Keeping a healthy, clean home is always a concern when sharing it with a dog. Just like us, dogs need their bathrooms. But what if you can’t get home on time to walk him? What if you can’t take him out several times a day? Or if it’s raining cats and dogs or snowing? So where does he relieve himself? Our dog pad has several unique features and benefits unlike anything else you’ll find. 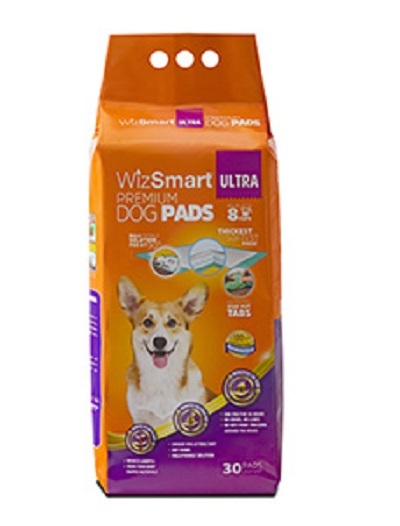 WizSmart Super Absorbent Dog Pads absorb all the liquids your dog eliminates in a day - up to 10 cups! It dries quickly, so no messy tracking in the home. It won’t leak, so forget spills and smells. It stays put, and thanks to a one-of-kind attractant formula, your dog always knows where to find it. WizSmart pads work every time and over-time for when you’re out, but your four-legged friend has just got to go! And what happens when you’re both on the go? Don’t worry about taking your pup to a friend’s house—just bring our pad and he will go where he should. Every time. Stay Put Tabs keep your Dog Pad where you place it. The four patented Stay Put Adhesive Tabs make sure the pad stays where you put it. When your puppy or dog is ready, the pad stays still, so there’s no unpleasant surprises to clean-up. And we all know that male dogs have their own way of going to the bathroom. Put the pad halfway up the wall, on a 90-degree angle. Problem solved. Thanks to superior absorption and quick drying, one pad is good for up to 24 hours. That’s not just economical and practical, you’re helping to reduce the amount of plastic waste and materials that end up in landfills. WizSmart is a very ecofriendly dog pad. We save over 120 million unused diapers every year. Instead of going to landfill, we repurpose them to use as material in our unique super absorbent blend for our pads. We also use Eucapet fiber made from eucalyptus. It's a WizSmart choice that’s good for you and our planet! Have a convenient and worry-free day while giving your best friend the confidence and comfort of healthy and clean indoor living. WizSmart is available in the WizSmart Super, a lighter weight option to the original WizSmart Ultra, and the WizSmart Ultra XL, a pad 43% larger than the regular Ultra. Watch how quickly our dog pads absorb moisture, leaving your pet (and your floor and furniture) dry and clean. Ensure comfort for your pooch and your own peace of mind.